Campbellville, Ont. – May 18, 2018 – Once again, UFCW Canada Local 12R24 members across Ontario look forward to your support on May 26 for the annual Returns for Leukemia bottle drive. Returns for Leukemia is a fundraiser held each May by the hard-working members of UFCW Canada Local 12R24 in partnership with The Beer Store to raise funds and awareness for the Leukemia & Lymphoma Society of Canada (LLSC). Donations of customers' bottle deposits go directly to support the research efforts and awareness initiatives of the LLSC. Last year, through a combination of bottle and cash donations, the event raised an astounding $1,804,912 for the fight against leukemia, lymphoma, Hodgkin's Disease, and other forms of blood cancer. This year's event will be held on Saturday, May 26 at Beer Store locations across Ontario. Customers will be invited to donate their bottle deposit refund, or make a cash donation, with 100 percent of the proceeds going directly to the LLSC. 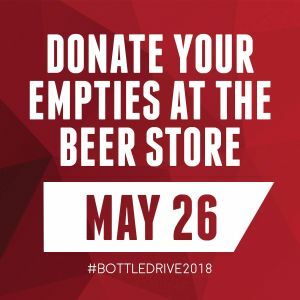 In addition to donating your empties, UFCW Canada members, family members, and friends in Ontario can also volunteer to assist in greeting customers on May 26. As well, you can help raise awareness of the event by posting pictures of your return visit or volunteering efforts using the hashtag #bottledrive2018. For more information about the Returns for Leukemia bottle drive, including information on how to volunteer, visit https://bottledrive.ca/.